We won! The monstrous, 1500-slot-machine gambling palace planned for downtown Vancouver is dead. Now the city must decide what it wants to see there instead, on that large question mark of land. 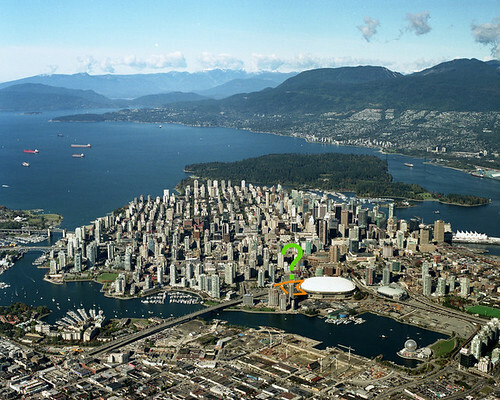 The BC government owns that land, and ideally the City of Vancouver will now pressure it to come up with something more forward-looking and less iniquitous for that site. A majority of Vancouverites have now made it clear that expanded state-sanctioned gambling isn’t part of their vision for this town. People are starting to realize that as an industry, gambling doesn’t create value or wealth, it just moves money around via a predatory, regressive tax on the poor and afflicted. 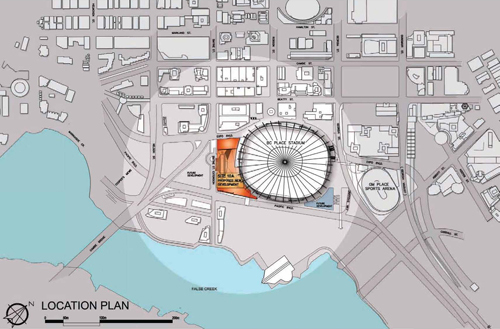 They get that it’s the opposite of good government, let alone good urban planning, and they think a giant square black box in the downtown core—some of our supporters called the design a “mega deathstar”—is a joke. 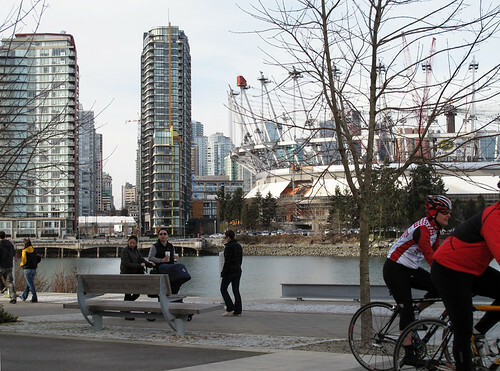 Vancouver tends to have amnesia, so it’s worth pointing out that Vancouverites have defeated bad mega-projects before. In 1994, a well-organized group of citizens killed an equally cheesy Vegas mega-casino on the waterfront. * Earlier, in 1967, another major citizen offensive defeated a disastrous freeway plan, making us one of the few cities in North America without freeways in the city core. Both of these plans were said to be “done deals,” yet citizens went ahead and undid them. If Vancouver deserves any part of its “most livable city in the world” title, it’s in part thanks to informed citizen action. It was exhilarating to us that members of both those earlier fights came forward to help us with ours. At the ‘Vancouver Not Vegas’ casino victory party on Saturday, held at this studio, internationally renowned Vancouver architect Bing Thom spoke about the need for decisions to come from below in this city, not from above, and he hoped that neighbourhoods and citizens would take some power back from those who control City Hall. Expecting politicians and developers to dream up an imaginative future city on their own is a long wait for a train that won’t come. The site in question is one of the last pieces of empty real estate in the city, and no doubt the powers above will try to do something dark and tasteless with it. The City did give it permission to move the existing, smaller casino there, as a concession, but that will be an uphill battle because they’ll have to consult with the public on that again, according to BC Gaming Policy law (something all the City Hall-watching bloggers don’t seem to have grasped). Still, the relocation is worrying, because governments and their casino friends (always big political donors) never cease trying to expand gambling. Anyway, whatever these guys propose, we will be watching. We will not certainly not support any re-emergence of the same mega-deathstar design with its massive blocky podium. That design is an architectural abomination and a permanent invitation to future gaming expansion. Vancouver is supposed to be a walkable, street-level-friendly, cycling city, not a city of block-long, faceless gambling prisons. See renowned Vancouver architect Peter Busby and ex-City Planning head Penny Gurstein‘s arguments on that topic. We hope Vancouver keeps up its loyal support of the Vancouver Not Vegas coalition. More than 150 of you showed up to speak to City Council on this topic, in a record-breaking consultation process, and more than 500 of you wrote letters. Thank you! Without you, we’d have achieved exactly nothing, and we may still need your vigilance. We also hope that more people join civic fights. It’s worth it. If you are in design or architecture, it indicates to people that your outlook is courageous rather than just mercenary, and everyone knows on a gut level that courage is key to aesthetics. We are pretty disappointed with certain powerful individuals who said no to lending us their names. You will see them by their absence. To see the scores who did join, view our right-hand masthead at http://vancouvernotvegas.ca. If Arthur Erickson were alive, he’d have joined us in an instant. Lastly, many are saying that City of Vancouver Planning Director Brent Toderian should leave after supporting this ill-conceived casino plan so enthusiastically. Its business rationale has now been completely discredited as Hollywood accounting (that’s putting it politely), its design is widely mocked, its social blight completely excoriated by top medical health officials, and Toderian’s own report on the casino was poorly researched and executed. People feel the same way about the City Manager. Vancouver deserves better performance than this. Thanks to my teammates and friends Sandy Garossino, Andy Yan, Bing Thom, Peter Ladner, Ian Pitfield, Judy Rudin, James Johnstone, Tom Durrie, Amir Ali Alibhai, Sean Bickerton, Susan Marsden, Diana Lam, Colleen (Hardwick) Nystedt, Ann Gibbon, Katherine Wellburn, Alix Brown, and every other name on our masthead, and all the friends who supported us and made us dinner. Readers, I’m surprised you are still visiting this site despite its obsession with this local campaign and despite its patchy publication history over the past 8 months. Thanks for reading. * It’s interesting that the 1994 mega-casino was promoted by David Podmore too. He’s currently the chair of PavCo. This entry was posted on Monday, April 25th, 2011 at 1:27 pm	and is filed under architect, architecture, British Columbia, Canadian design, cringe list, design, green, Ouno Design News, urban planning, Vancouver. You can follow any responses to this entry through the RSS 2.0 feed. You can leave a response, or trackback from your own site. The dedication and devotion that you have displayed is an inspiration. All too often – we are done in by the done deal. We elect them and set them free – if they act on our behalf half the time we feel we’re o.k. How about starting with constituent apps! if you vote – you are entitled to download a polling / referendum app that let’s your rep know your opinion. And again – thanks for the inspiration for the rest of Canada! and congrats!